Taking band pictures is a challenging job for photographers, regardless of their skill level. As a result, saying that taking band pictures is a challenge is a severe understatement. With that said, it is not impossible to capture frame worthy concert shots. The trick is to employ certain techniques to make the most of less than ideal shooting conditions. When you are shooting live bands, timing is everything. Every moment counts when you are trying to get your subject in frame and in focus. Using compact point-and-shoot cameras to accomplish this feat is next to impossible, since they are generally slow to start up, slow between photographs, and have obscenely long shutter-lag. If you want to capture incredible concert photographs, you are better off shooting with a digital SLR camera, which offers more options and increased flexibility in shooting. Digital SLRs also allow you to immediately check whether the photo you captured is to your liking. Backlight band members for rockin' photos. 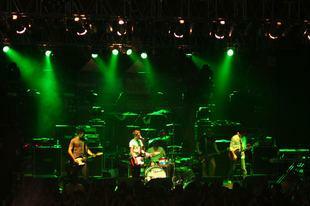 Most big name bands have sections of the stage that are well lit and others that are shrouded in darkness. In addition, while spotlights are used to illuminate artists, this type of lighting is not always enough to produce a decent shot. To compensate for the unpredictable lighting, it's a good idea to use a higher ISO. A higher ISO will help increase your camera's sensitivity to light, though it will also produce some graininess in your photos, which can result in a reduction of photo detail and clarity. Fortunately, this can be fixed with photo editing software. Another way to improve shots taken in low light is to keep the f-stop low. This will leave your aperture wide open to absorb as much light as possible. Unless you are a professional concert photographer with an all-access pass that allows you to roam freely to capture your shots, consider purchasing a good zoom lens. Pack an 18-70 and 70-300 lens with you and experiment with both during your shoot. If you are forced to use your camera's standard zoom lens, remember to steady yourself to minimize camera shake. In addition, when zooming in on a subject, it's a good idea to press the shutter button down in two steps to lock the focus and exposure. Know before you go. Concert lighting moves in patterns, so knowing the method behind the madness can help improve your shots. If it's possible, try to sit in on the band's sound check to get a feel for how the lights move prior to the start of the concert. In addition, if you observe how the artists move, you can locate the spots where they might pose or limit their movements. For example, if you are familiar with a song, you'll know exactly when the guitar solo will take place. This information will allow you to get over the guitarist and photograph him while he is standing still in the spotlight. To capture dynamic band pictures, it's necessary to vary your shooting angle. For example, rather than taking a dozen medium shots of the singer wandering around the stage, consider taking a close-up shot of the guitarist's hand strumming his instrument. 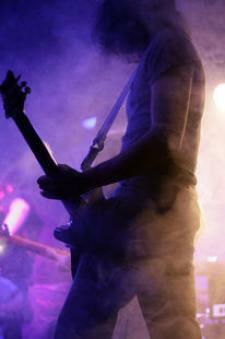 Or, consider positioning yourself so that you can backlight members of the band during their solos. By experimenting with angles, you can leave the venue with interesting shots instead of standard marketing photos. Finally, when taking band pictures, it is essential to practice patience. It's not everyday that your shooting conditions include screaming fans, overzealous seatmates aiming to crush your camera, and crowd surfers kicking you in the head. By remaining calm and employing the aforementioned tips, you can improve your chances of snapping super concert photos.